In addition, we are still accepting emails for the free autographed mini-comics. All you have to do is send your address to fablesoftheflyingcity (at) gmail.com, and you’ll be entered to win! The costume contest is still going on, so send a picture of yourself in your Amperstamian finest to win original art by Steve Walker himself! 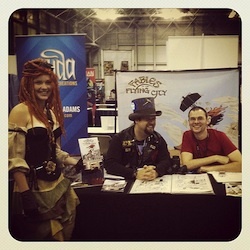 Steve and I spent last weekend at New York Comic Con, meeting longtime fans and creating new ones. We sold a huge bunch of mini comics at the con, and now want to give you a chance at getting a signed copy of your very own. Just email your mailing address to fablesoftheflyingcity (at) gmail.com with “Mini Comic” in the subject line before December 1st, and you’ll be elligible to win one of 10 autographed copies of the mini comic! At NYCC, Steve and I were so blown away by Liza James amazing representation of Ashe, that we wanted to see more of the characters in the flesh. To that end, we are having the first Fables of the Flying City Costume Contest. Just send a photo fo yourself in your Amperstamian finest to fablesoftheflyingcity (at) gmail.com, with “Costume Contest” in the subject and your mailing adress and who your dressed up as in the body. All contest entries will be posted on the Fables of the Flying City Facebook page (unless you tell us not to). Steve and I will pick the winner on December 1st. The winning prize is the original art of the cover of the mini-comic, a fine peice of draftsmanship, indeed. Thank you, everyone who came by the table at NYCC, everyone who is just now discovering us becuase of the table at NYCC, and all of you who have supported from the begining. Specifically, SPX and New York Comic Con (though MoCCA, Dragon*Con and Baltimore Comic-Con get some love, too). We’ll be at NYCC, rockin’ table L5 in artist alley–it’ll be the one with the giant “Fables of the Flying City” banner) where Steve will be showing off his amazing artwork and Jared will be on a panel with Tee Morris, among others, at 9pm on Friday. Here’s the audio for the Pitch Worshop I moderated at Balticon. I like to believe the audience got something out of the workshop beyond my tendancy to grandstand. The full audio of the Flying City Circus panel at Balticon! Featuring the begining of FABLES OF THE FLYING CITY Book 2, “The Mouths of the Dead,” a prize giveaway, and a spirited question and answer session. The questions are very faint, but I think my answers can give you an idea of what the questions were. Congradulations to Hugh O’Donnell winning his name in Book 2 and J.C. Hutchins for winning what is so far the only printing of Book 1. Jared Axelrod and Steve Walker talk about one of the true graphic novel classics of the past few years. A bit of an update about the future of the Fables of the Flying City series, along with news about the graphic novel, The Battle Of Blood And Ink. This the graphic novel that we have been working on for the past five years or so. Actually, it isn’t. It’s merely the cover of the graphic novel we have been working on for the past five years or so, wrapped around another hardcover graphic novel. That said, it’s the right weight when I hold it my hand, and if you were looking for THE BATTLE OF BLOOD AND INK: A FABLE OF THE FLYING CITY come May of 2012 (and why wouldn’t you?) this would be what you looking for. 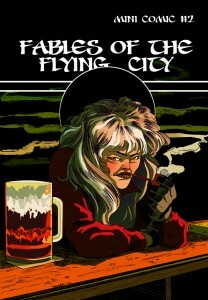 Fables of the Flying City had been on my radar since I heard Balticon buzzing about it (via twitter) last year. Of course, then I completely forgot about it until Mainframe (Richard Green) had the author, Jared Axelrod, on his wonderful interview show, Geek Out with Mainframe. I then forgot about it again (seriously, I’m simply terrible sometimes) until I asked Richard to remind me to subscribe. The act of asking someone else to remind me naturally caused me to remember and I subscribed. So, on to the review. Ashe, a young woman from the streets of the flying city of Amperstam learns what it takes to be a member of the Aerial Guard, and finds herself at war with an invading empire and the rulers of the city she has sworn to protect! Production: Mr. Axelrod, early on shows that he’s not too worried about production and talks to his listeners about different setups he’s experimenting with. These eps are short, often in the range between five and ten minutes. It isn’t unusual for Mr. Axelrod to give his listeners as much metatalk as there is story. Since most of the metatalk I found informative or amusing, I didn’t mind. However, I personally prefer this metatalk to come AFTER the story, but that is only my personal preference. Cast: Mr. Axelrod does a nice job of self reading most of the story. He has a guest reader for several episodes, but the story is always a single voice. I liked Mr. Axelrod’s readings. He has an infectious quality to his voice that makes your root for his heroine. I preferred his voice to his guests, but again, that is probably just my preference. All were easily understood and read the parts well. 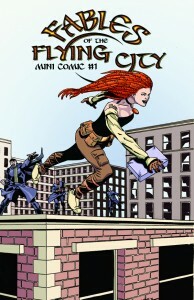 Story: Fables of the Flying City is going to be a graphic novel. This podcast that Mr. Axelrod has provided is actually the prequel to that graphic novel. Having said that, this prequel stands on its own and does what any good prequel should do: makes you care about the characters that will be moving on. 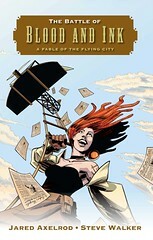 Verdict: I truly enjoyed Fables of the Flying City. 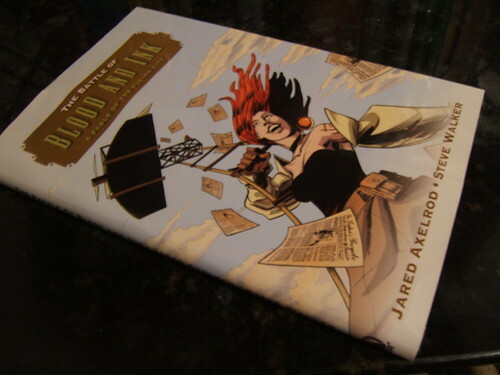 It is the first story that I’ve heard that I would classify as true steampunk and not a story with steampunk elements. The characters drive the story and your imagination is used (appropriately) to fill in some of the technology. I always looked forward to hearing the latest episode of Fables of the Flying City and I think you will to. I am very anxious for the graphic novel to make its way into my hands. Don’t forget, if you send an audio comment to me at Odin1eye at viewfromvalhalla dot com, I’ll include it in the podcast version of this episode next weekend. Disclosure: I do follow Mr. Axelrod on Twitter and find him quite the intelligent tweeter. I don’t converse with him often or at length. I was not offered a free copy of the graphic novel for review (grinding teeth) or anything else in return for this review.